Thank you to all who submitted for the Clear Dollar Stamps Design Team Summer session of Clearly Crafty Crew! There were SO many applicants, and every single one of you had Design Team talent! It is such a difficult task to only select 5! I sincerely hope we have as many talented artists apply for the second half of the Clearly Crafty Crew as we did for this one! I hope you will agree these ladies are all extremely talented, well versed and bring a wonderful variety of styles to the Clear Dollar Stamps Design Team for the first half of this summer. Won't you join me in welcoming them? I look forward to seeing their beautiful artwork displayed using Clear Dollar Stamps. Are you ready for a Summer Stamp Off???? We are so excited to announce that we have openings for a Summer Design Team! Our Summer Designers will be called the Clearly Crafty Crew. We are calling it the Summer Stamp-off Design call, part 1, and we want you to submit design applications! Applications are being accepted and considered through the end of the day March 17, 2010. THIS IS THE DEADLINE FOR APPLYING. The term will be be 3 months (May, June, and July). Stay tuned as we will have Design Team call number two in June for a 3 month term (August, September, October). There are 3 Sneak Preview spots (you will design samples a month prior to the release of the stamp sets and post sneak peeks the last four days of the month) and 2 Monthly release challenger spots (these two spots participate in challenges on Split Coast Stampers or Paper Craft Planet during the month the stamps are released). The term begins as soon as you accept the invitation, and continues through June 30, 2010. Sneak preview artists will be designing with May, June and July stamps and will participate in the monthly sneak preview blog period. Monthly challenge artists will be designing with April, May, and June stamps during the release month, creating samples for SCS challenges, or other public online blog/papercraft challenges. Every applicant will be notified on or before March 27, thanking you for the entry, regardless if you are selected or not. Selected Designers announced publicly March 28, the first day of April sneak previews. To be a Sneak preview artist, you must have a blog. To be a Monthly challenge artist, you must have a public gallery at SCS, and familiar with their daily challenges. An optional gallery, in addition to the above, is PCP. 1. Minimum of 8 individually hand stamped cards or projects using the new release stamps per month, and more can be requested by the designer if your time allows. 2. The Clearly Crafty Crew will join the exclusive CDS DT discussion forum during their term, and receive a store discount. 3. Designers will be required to upload all quality photographs of projects (in addition to your own blogs/online galleries) to the exclusive CDS DT gallery. Logins and instructions will be provided. 2. LINKS to 2 or 3 links to recent handstamped artworks. Please send direct links to posts, not general main page blogs, and please do NOT attach photos to the email. 4. Include your name, state or province you reside in, and a brief note why you think your talent is a fit with CDS. 5. DEADLINE for applying: Wednesday March 17, end of the business day, CST, 9 pm. Shawna, please e-mail me (Katie) at mypaperhaven@gmail.com with your full name and mailing address. Ok, so here it is folks! Clear Dollar Stamps has a new look and you are going to LOVE it. Its been a work in progress but you now have a gorgeous new Candy Shop to satisfy your Crafty sweet tooth full of Clear Dollar Stamps Goodies. Click HERE to get to the store and shop away --- Calories NOT included! We can't have such a big event pass us by without lots of fun and CANDY! Wow, there is so much to share, I'm not even sure where to start! First, Clear Dollar Stamps would like to welcome Peggy Russell to the design team for the rest of the month. She has been working on some sweet cards that she'll be sharing on her blog: Beautiful Greetings. Make sure to go visit her and leave her some sugary goodness. We think she is an extra sweet treat to the team. Welcome Peggy - can't wait to see all your goodies. Peggy will also be joining some of the team members in today's BLOG HOP celebration. Well, all week we've been lucky enough to have Design Team Member Candy Fosta share some of the cutest things using a new stamp set called Everyday Jar-gone. This stamp set (look below) is now available for 30% off the full retails price of $14.99. But this price is limited and will only be available until the end of this month - August 31st. Then on September 1st, Everyday Jar-gon will be available at its original retail price $14.99. So definitely take advantage of this sweet deal. Candy has one more little treat to share with us today. I absolutely adore this, again such a cute little treat to pack into a lunch or snacks for a little outside picnic. My boys would love these! So in order to win the Everyday Jar-gon set on this blog, all you have to do is answer the question below in the comment section below. What kind of projects/cards would you like to see from the Clear Dollar Designers for sneak peeks? But that's not all! When you place an order on the website you will get this very cute dragonfly and sentiment stamp set FREE. Whoa... I feel like an infomercial here, but do you want to WIN IT ALL? Start here with Candy's letter (below) and hop, skip, click right on down the list to gather the next letter until you end up with a very special phrase. I'll let you know what to do with that phrase in just a minute. A random winner will be the lucky recipient of the entire set of new release stamps for the month of September!!!! Now, I don't have a picture of the stamps because that's a secret, but rest assured... there are lots and you'll love them! I'd like you to tell me which Everyday Jar-gon project was your favorite and whose blog you found it on. You are HERE... head on over to Laurie's blog. HINT... your best bet is to go in order! 2. Your favorite project using the Everyday Jar-gon set and the blog you found it on. Wow... go have some fun! Thanks so much for playing along with us this entire week. Katie and Candy signing off for Clearly iStamp. Charlie's last hint... don't miss it! I'd love to see stamp sets pertaining to special needs, i.e. wheelchair, crutches, etc. Love the group stamps...keep up the good work. Denise, please e-mail me (Katie) at mypaperhaven@gmail.com with your full name and mailing address. CLICK HERE to see the list of winners we've had so far. I hope the anticipation hasn't killed you yet and thankfully its almost over. Tomorrow is the BIG REVEAL and Charlie has one last and final hint for you. There isn't anything else you could possibly want more! So this is Charlie's last hint for the week and of course tomorrow is the big day, but I do want to let you know what to expect for the big party. This party is the best kind since you don't have to fix your hair, put on the make-up or even get dressed. We will be having a BLOG HOP tomorrow to celebrate the big event here at Clear Dollar Stamps and there will be random drawings at each stop as well as a GRAND PRIZE. All the details will be posted first thing tomorrow so don't worry. But before we go, I've got another fabulous gift idea created by Design Team Member Candy Fosta. She used another purchasable template created by Lauren Meader that you can find HERE. Oh my isn't this just adorable? Those daisies look like they were freshly picked and placed right onto the bag and card. Any guesses as to what the stamp set is that will be revealed tomorrow? You are going to love it, but don't worry, I have one more sample to show you tomorrow and we didn't even get to all of them from the set. This is our last day of the little Charlie give away and your question is simple. Tell me what you think the BIG REVEAL is that we are celebrating tomorrow. That's all :) You've made it this far so I EXPECT to see you tomorrow with your SWEET TOOTH salivating and ready to go! I love to learn everything like, techniques, different styles of cards, how to use the same stamp different ways, and different ways of coloring images. Thanks so much. Cathy, please e-mail me (Katie) at mypaperhaven@gmail.com with your full name and address. Remember, I'll be passing on a list of all blog candy winners to Lori at the end of the week. Now onto what Charlie has to share with you today. Yes, Charlie knows how to lay on the sugar doesn't he? But thankfully, the kind of sugar he wants to share with you isn't the fattening type... phewww is all I can say and you will too. I can't wait for you to see what kind of candy coated goodness he has in store for you this Saturday. Don't worry, you can even sleep in on Saturday and still enjoy the day's festivities! Good things are to be savored and enjoyed. But, as been the tradition this week, you can't leave here without the visible type of candy and our very own Design Team Member Candy has created another fun and easy project for you to recreate. Just don't recreate too early since you'll want to pick up this sweet set that will make this project just perfect! Ok, I guess I fibbed just a tad... this treat is definitely caloric, but only if you eat it yourself. So make a few of these and send them on their way. Candy's little project is super cute and would be appreciated by your adult cohorts as well as the little ones. How special would your little or big one feel if they found this in their lunch. So many ways to add this little image to all sorts of different baggies, boxes, etc. So are you ready for another opportunity to welcome this little Charlie into your home? Tell us your personal preference for stamp sizes --- individual, groupings, small, large? Tell us any type of theme of stamp/stamp sets you would like to see? Tell us any type of products you would like to see at the store? Only one more day of hints and then the Sweet Reveal Friends.... can you just stand it??? Thanks so much for sticking with us and come on back tomorrow. See you soon! Charlie is sweet on you!
" I like the Blown Away set. I have some great ideas running thru my mind to put to cards. Michelle, please e-mail me (Katie) at mypaperhaven@gmail.com with your mailing address. Well, it looks like we are making progress and its already Wednesday, but its still early and Charlie isn't done teasing you though and has another hint to share. "Gumballs, jelly beans, candy corn too... wait until you see what CDS has in store for you!" Hmmm... so do we have you thinking yet? All I'm going to give you today is that the event happening this Saturday is SWEET! But again, we can't leave you without some eye candy and another chance for the adorable Charlie stamp. But first, feast your eyes on this adorable basket. Design Team Member Candy Fosta created this super cute packaging for a super cute new stamp set that is going to be available very soon. Wouldn't this be a perfect little pick me up for someone who isn't feeling well? Candy used THIS PURCHASABLE template created by Lauren Meader to create her ensemble. I wouldn't mind catching any bug if they were as cute as these little guys. Who needs Purell if you could contain them in a cute jar too. Now how about another chance at this adorable Charlie? I've been reading through the comments and lots of you are familiar with Lori's blog, but I've noticed we've been welcoming new visitors as well. For those of you that are new, like I said this is Lori's blog that features her company Clear Dollar Stamps and I (Katie) come and help out by by writing up different types of tutorials, techniques, and stamp features. Lori does incredible tutorials as well, so you should definitely take a look in the archives and check them out. Unfortunately, she is one very busy lady and has allowed me to help out. So, all you have to do to be entered in today's blog candy is let Lori and me know what kinds of things you would like to see on Clearly iStamp. Are there certain products you would like featured, certain techniques you would like seen, specific types of tutorials, etc. And its ok to say you like what you've been seeing. Be honest and the sky's the limit. The wonderful thing about Lori is that she truly listens and takes to heart what your opinions are. This little guy you are commenting for is approximately 2" tall and just waiting for a lovely new home. So that's it for today, but like the repeating mantra for this week... come on back for more tomorrow! We can't possibly let that sugar high go down could we??
" I love Charlie!! CDS are first quality and very affordable." Kerry, please email me (Katie) at mypaperhaven@gmail.com with your mailing address and I'll pass it on to Lori. **** Also note, that if you are an early winner, your blog candy won't be going out individually but rather as a group just so its a lot easier for Lori. At the end of this week's festivities, I will compile a list of all the winners and then send if off to Lori and she will ship things out. Thanks for understanding! "Ice cream and candy both are sweet, stop by CDS for a special treat!" Remember that all of Charlie's hints are for this Saturday so make sure to come on by for a visit. I betcha you'll want to stay a while too. Today, I want to focus on one of the main things that I personally love about Lori's stamps that she offers at Clear Dollar Stamps. It is also one of the many things that you all love too and of which many of you commented on yesterday. One of the components of affordability that I enjoy are the many smaller stamp sets and especially the Dollar Stamps that Lori provides at the store. All the Dollar Stamps are never more than $2, with the majority of them being only $1.00. They are affordable but still the very best Quality of Clear Stamps out on the market. They are a wonderful way to learn about Clear Stamps and Clear Dollar Stamps too. They are a great building block to any other stamp set you might have. They can be mixed and matched. They are perfect if you enjoy inchies. They are just darn cute! So with all this said, I do have some cards to share with you using some soon to be available Dollar Stamps that range in price from $1 to $2 and some ways to use these great little but definitely affordable stamps. 1. I often like to simply make smaller cards with smaller stamps. Here, I've made a group of holiday gift tags. On the inside all I have to do is write/stamp the to and from and they are ready to give as gifts or use myself. I also left the twine loose so that they can easily be attached to a present or gift bag. These tags are just 2" square. 3. Use pretty designer paper and keep the focus on the small stamp. This is another standard 4 1/4" x 5 1/2" size card. 4. Use small stamps to create your own background. This also happens to be a smaller card (3 1/2" x 2"), but you could easily do this same thing with any size card. I used an emboss resist technique, but any way you wanted to stamp would be beautiful. CLICK HERE for a previous tutorial that uses a version of the technique I used on this card. 5. Repetition is fun with smaller stamps. 6. Again, went small with this one. A perfect accompaniment to any gift. Now don't be sad if you didn't get yesterday's Charlie because you've got another chance today. All you have to do is browse through the Dollar Stamps and let me know which one would go in your shopping cart first. Click HEREto start browsing. You have all day to play and browse and I'll post the winner with tomorrow's post. You just might win this bad boy :) He's approximately 2" tall and would look just fab in your stamping collection! Thanks for coming on over to visit. Feel free to keep commenting every single day, everyone here loves to read what you think and like! And definitely come on back every day for the rest of this week. Charlie says "SAVE THE DATE"
Hi Friends, its Katie here to welcome you to a wonderful Monday! Do you remember last Friday when I said to stay tuned for Monday and the ENTIRE week? Well, here it is... its Monday and you definitely want to stay with us all week and DEFINITELY want to be here this Saturday. "Something sweet this way comes!" For the rest of the week, Candy and I have taken over Lori's blog and we'll be sharing some hints and pictures of what will be coming. Lori and the Clear Dollar Design Team are incredibly excited for all the new happenings here at Clear Dollar Stamps. The culmination of all the excitement will happen this Saturday and YES... we will have prizes galore! You are just going to have to stay tuned and come back each day to catch the clues and feast your eyes on some eye candy. Don't think you'll be leaving today empty handed though. 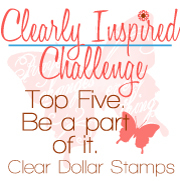 All you have to do is leave a comment on today's post and tell me just ONE favorite thing, fact, item, etc that you like about Clear Dollar Stamps. If you are new to Lori and her company, feel free to browse around and let me know if there is a stamp that catches your fancy! Every day, including today, I'll randomly pick a winner to win this super cute Charlie (pictured below). He is approximately 2" tall and will be a great addition to the Charlie's you already have or will get you addicted to the Charlie line. So, I've teased you a bit, but I also want to leave you with some very sweet eye candy brought to you from Design Team Member Candy Fosta! This is a cantilever box that Candy made using a purchasable download created by Sarah Bonsell that you can find HERE. This box is amazing and Candy did an awesome job creating it. I know that the box is awesome, but focus your eyes on that super cute Jar on the card and the matching sentiment. No more said! So... I certainly hope to see you tomorrow and don't forget to leave a comment today. I'll draw a random winner sometime late tonight.